The year was 2001. In an epic movie sequence that will be remembered for many generations to come, the protagonist is about to be tortured by electrocution. Unfazed by the hissing sound of electricity, he smiles a defiant smile and spews out the gem: a�?Current causes shocks to people, but if it touches Narasimha, current will have to face a rude shock!a�? 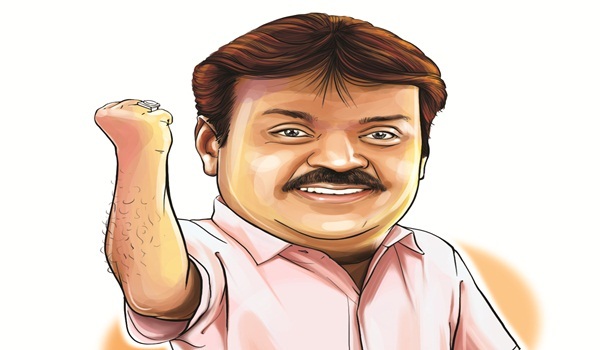 With that punch dialogue, Tamil movie star Vijayakanth went viral for the first time ever. Cut to 2016. Whether he likes it or not, the self-styled a�?Black MGRa�� is now the most popular Tamil comedian online. Any meme associated with him, gets a thousand shares. Any video featuring him, gets more eyeballs than Kim Kardashian on a nudist beach. So what is it about him that cracks people up? If one were to write an algorithm, essentially therea��s one recurring aspect: the village bumpkin who fumbles over alien sounding English words, often mangling them into pedestrian reference points from his life. Yup. Hea��s the sort of guy whoa��d mix-up Lionel Messi with Lion Dates Mixie, Selfie with Selvi, Kung Fu Panda with Kunguma Poo Bonda, Babu Ganesan with Barbeque Nation, and Perumaal with Forum Mall. The bizarre aspect of this sub-genre of memes is that ita��s entirely made up. The unflattering nature of the word play reduces Vijayakanth, the leader of Opposition, into a dim-witted doofus. Which is probably why the DMDK has termed it derogatory. But is it entirely unfair? Herea��s a guy who thinks Sundar Pichai of Google deserves the credit for bringing TV into our homes. Herea��s a politician who delivers a campaign speech and rounds it off by asking people to vote for AIADMK instead of DMDK (his own party). The bitter truth is that the legend of Vijayakanth has been of his own making. When some clever soul did a Dubsmash of the unintelligible Bahubali Kiliki dialogues using footage from his Kancheepuram speech, it struck a chord with most of us, as no one understands what Captain speaks. Not even himself. His jocular mime act during rallies, his colourful rebukes of supporters, his rustic spitting on journalists, all add to the persona of a classroom clown. But the man who won the Filmfare Award for Best Actor in 1986, is highly capable of surprising us. Make no mistake: if he becomes Tamil Nadua��s next chief minister, he might have the last laugh. Got your booty of Captainisms? Share them with love to anantha@albertdali.com, who is back with a fortnightly column on viral videos.